To devoted fans, the Breeders’ Cup World Championships is the Super Bowl of horse racing. It’s the culmination of an entire racing season: a two-day event where celebrities gather, fans flock, and champions are crowned. We built a new website for our longtime client that paid off the luxury and grandeur of racing’s biggest international competition. We were challenged with creating a destination for fans that was worthy of the two richest days in sports. 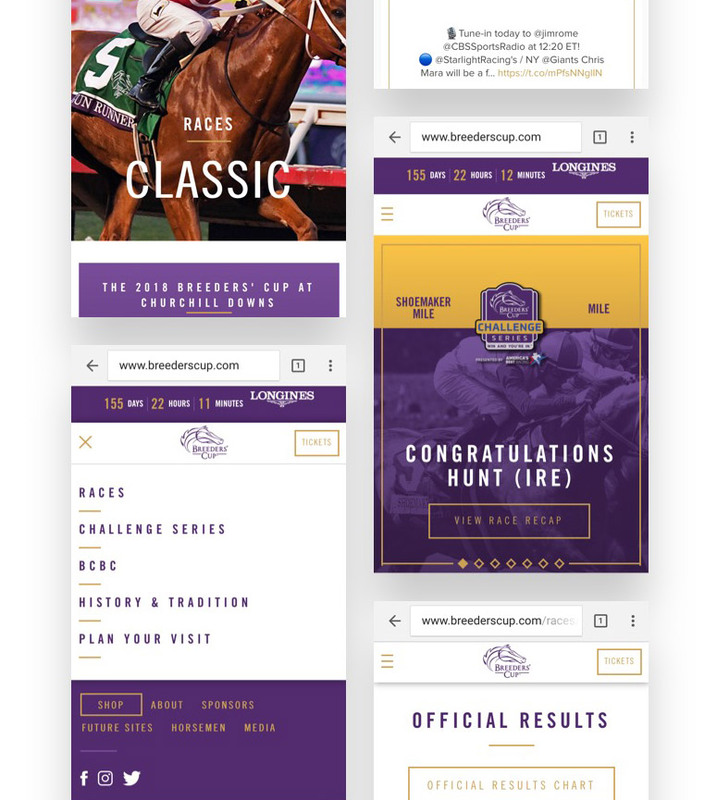 The site needed to be an efficient marketing tool that drove ticket sales, encouraged wagering on the weekend’s 13 championship races, and introduced new ways for fans to experience the Breeders’ Cup regardless of location or device. The redesigned BreedersCup.com is a modern, fully responsive site that allows fans to learn about Breeders’ Cup history, track and handicap the top contenders easily browse seating options, purchase tickets, and experience the event like never before. In thinking about where our audience would be viewing the site, we had to ensure the coolest features could be fully experienced on a mobile browser, especially for those fans attending the two-day event. The site featured the official debut of the Aston Martin Jockey Cam worn by hall-of-fame jockey Mike Smith, as well as a new user-controlled 360-degree paddock camera. Fans taking in the weekend’s races could now experience everything from an entirely new perspective. While the Breeders' Cup races are running, the website features real time updates of the contenders and events. It even contains live simulcasts of the races, providing visitors with a choice of three different live streams that included all 13 Championship races. The 2017 Breeders’ Cup World Championships was one for the record books. With the help of the newly designed BreedersCup.com, the event was a sell-out; the two-day on-track wagering total of over $25 million was the highest in the event’s 34-year history and helped us achieve the highest site traffic on record.